Automatic Control specified by “M” in the model code. BetaSwage’s Automatic Control is our most popular control and is also the default control listed in the data sheets. (‘M’ in the model code). It’s popular as it offers the operator full functionality of many features considered ‘extras’ by other manufacturers. Once the operator has determined the required swage diameter for the hose assembly to be swaged, he refers to the dial vernier reference chart on the fascia of this control to calculate the dial vernier offset value and the required die set number or color. I.e. Die Set Number + Dial Vernier Setting = Final Swage Diameter. When pressed with the crimp button, this button allows free movement of the head to be fully in position so that the Quick Change Tool for dies can be used. This means you do not have to re-set the dial vernier to 0.00 setting. This control varies the diameter that the dies open. When swaging multiple assembles, only opening the dies just enough to remove the swaged assembly, will significantly increase production rate. By attaching the foot pedal, the control switches instantly to full ‘Automatic’ and ‘Dead Man’ control. By pressing the foot pedal, the dies will begin to move inwards. Releasing the pedal and the motion of the dies stops. Pressing a second time and the dies move inwards again. Once the required set point has been achieved, the LED light will come on and the dies will automatically retract to the retract diameter setting. Releasing the foot pedal will start the inward sequence of the dies once again. If the swage press is switched on, the LED set point will flash ON OFF ON. When the crimp button is pressed, the LED set point will switch off, the electric motor will run and the dies will move inward. The electric motor will run for 20 seconds after any manual input to the swage press. The LED set point will then go back to flashing on and off to inform the operator it is in ‘Sleep Mode’. Subsequently it is never necessary to switch the electric motor on or off as this is carried out automatically. Note that the swage press can be left in ‘Sleep Mode’ indefinitely. Automatic control offers some crimpers the capacity to only develop radial load if the correct die set is installed. This benefit protects the press against damage and saves the hose assembly from being destroyed. Operating a swage press at incorrect voltage results in irrevocable damage. Automatic Control protects against incorrect voltage by isolating the press and sending a signal with the LED set point switching between on and off. The swage press can then be switched off at the isolator switch and the problem immediately corrected. 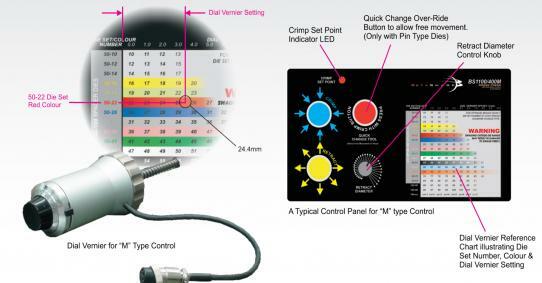 When all electronics and voltage inputs are functioning as required, the LED set point will flash ON, OFF, ON. If the set point shows OFF and there is power to the swage press than this indicates a failure in the control system. If the LED set point shows ON ON ON, then this indicates an open circuit to the dial vernier. With the Automatic Control, any possible failures can be easily diagnosed and the necessary corrections carried out quickly.